Rep. Glen Kolkmeyer (53rd Legislative District) speaking on the House floor. 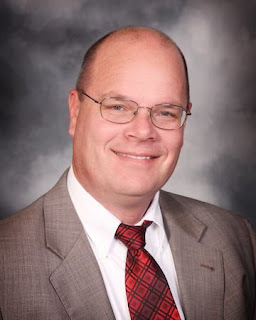 State Representative Glen Kolkmeyer, a Republican, represents Lafayette County and parts of Jackson and Johnson counties (District 53) in the Missouri House of Representatives. He was re-elected to his third two-year term in November, 2016. Representative Kolkmeyer currently serves as the Majority Caucus Chair in the Missouri House of Representatives. Representative Kolkmeyer was appointed and served two years as the Chairman of the House Transportation Committee. Then, he ran among his fellow representatives for a leadership position and became their Majority Caucus Chair. Kolkmeyer says it has truly been an honor for him to serve in House Leadership as Majority Caucus Chair, and he is looking forward to my next term as he is running for Speaker Pro-Tem. As a State Representative, Kolkmeyer representsapproximately 37,000 residents in Lafayette, Jackson and Johnson Counties. 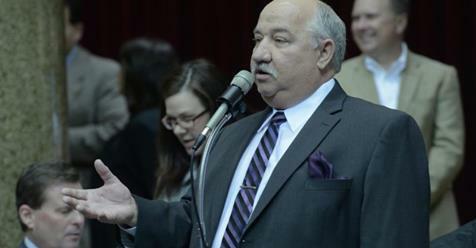 His duties include working alongside his fellow colleagues in the Missouri House, the Missouri Senate and the Governor’s office. Together, Kolkmeyer says they work to create laws and establish a balanced state budget. His legislative authority and responsibilities as a member of the Missouri House of Representatives include passing bills on public policy matters, setting levels for state spending, raising and lowering taxes and voting to uphold or override gubernatorial vetoes. Representative Kolkmeyer’s office is also responsible for providing governmental and legislative resources to our constituents and assisting them in navigating our branches of government. In addition to his legislative duties, as Majority Caucus Chair, Kolkmeyer says he has enjoyed having the opportunity to work with new House Members and assist them in learning the legislative process and procedures of the House. On behalf of the Public Policy Council, investors and Board of Directors of the St. Louis Regional Chamber, Representative Kolkmeyer was honored with their Advocate Award on Tuesday, November 28, 2017. The St. Louis Regional Chamber celebrated Representative Kolkmeyer’ s hard work on tort reform and his leadership in the Missouri General Assembly. He currently serves on the following House Committees: Administration and Accounts, Ethics, Joint Committee on Transportation Oversight, and Transportation. Representative Kolkmeyer was a former president of Missouri Propane Safety Commission, Missouri Propane Gas Association, Lafayette County Firefighters Association and Lafayette County Law Enforcement Restitution Fund, a member of National Rifle Association, a past board member of the Wellington-Napoleon Protection District and the Lafayette County 9-1-1 Board. Representative Kolkmeyer and his wife, Lisa, attends Calvary Baptist Church in Odessa. In addition to his legislative duties, Representative Kolkmeyer is owner and CEO of Energy Transport Solutions, Inc. Bates City MO. The family-owned and operated company hauls gasoline, diesel, propane and anhydrous ammonia. Glen’s parents, Omer and Dorothy started in the propane business in 1955. Glen’s Wife, Lisa, serves as the Office Manager, and the third generation: their son, Eric is the General Manager, and their daughter Emily is the billing clerk. On July 15, 2018, the company celebrated 63 years in business. Representative Kolkmeyer also served 20 years as Fire Chief of the Wellington-Napoleon Fire Protection District and served 39 years in the Fire Service. Representative Kolkmeyer currently resides in rural Odessa with his wife, Lisa. They have two children, Eric (Heidi) Kolkmeyer and Emily (Brian) Kolkmeyer Wilson, and five grandchildren, Aleah, Ean, Lucas, Zoe, and Mia. Lafayette County Candidates running unopposed in the November 6th election. "A proven leader to keep moving our county forward." This is my third term to run for Presiding Commissioner. I first ran in 2010 and then ran unopposed for re-election in 2014. Today, in 2018, I am running for my third term. I am an experienced businessman having owned and operated Hoflander Ford, Inc., in Higginsville since 1982. Today, my wife Kay and I continue to manage the business with the help of our son Keven Hoflander. I have also farmed my entire life and continue that both here in Lafayette County and in Cooper County where I still own and operate our family's Missouri Century Farm, one that is owned by one family for a century or more. I am happy and proud to say that Lafayette County is quite sound financially and all departments are operating at a professional and high level. We can be rightfully proud of all our office holders and the fine work each of them does each day in their respective departments. As Chief Budget Officer, I have been pleased to see our cash carryover fund grow so that we began the fiscal year with $1,749,735 and are operating on a budget of $5,784,430.00 for estimated expenditures, leaving a projected fund balance on December 31, 2018, of $1,055,213.45. This carryover along with anticipated general revenue has our county in solid financial shape. When I started in January of 2011, sadly the county was in a difficult financial state of affairs, spending out of a contingency fund, borrowing money rather than self-funding or leasing county and sheriff's department vehicles and not having the funds to maintain buildings, equipment and grounds to the degree they needed. By careful financial management over these past two terms, I have been able, along with the valued and capable support of our other two County Commissioners, to turn the county's finances around while giving employees long overdue raises. In addition to this financial success, our county commission has worked hard to initiate new programs and needed changes to others, build and maintain roads and bridges, placing the renewal of the County Capital Improvement Fund on the ballot this past April for voters to decide. It was overwhelmingly approved with the funds going to bridges and culverts, to special and common road districts, to cities and to county building and qualified projects. We have a long list of county Capital Improvement Projects we have completed in recent years, and I would be happy to discuss that with anyone interested in learning more details. In Lafayette County, we can be proud of our Courthouse, a structure that was built in 1847 and is the oldest courthouse in continuous use west of the Mississippi River. It is on the National Register of Historic Places, and known far and wide for the cannonball embedded in the upper left column, a remnant of the Civil War Battle of Lexington, fought Sept. 18, 19 and 20, 1861. The County Commissioners place high importance on keeping this historic structure properly maintained. I pledge my continued commitment and dedication to serving Lafayette County and pledge to always be mindful that we elected officials, first and foremost, serve you, the citizens of Lafayette County. I am honored and humbled to have your trust and support and look forward to additional productive and successful years ahead for our County. 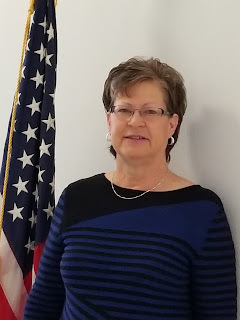 Linda Niendick, County Clerk, is running for re-election in November of 2018 and is unopposed. Bio to follow. Judge Kelly Rose is running for re-election in November of 2018 and is unopposed. She currently serves as Associate Circuit Judge, Division 3. Bio to follow. Judge Russell J. Kruse is running for re-election as Associate Circuit Judge, Division 2, and is unopposed. Comments from Russell J. Kruse, Associate Circuit Judge, Division 2. Starting this year, I was assigned to our county's Drug Treatment Court. This Court's goal is to treat the addiction and mold people into productive citizens, rather than punish and re-punish an intensified problem that causes increasing damage to families and communities. This treatment program requires the judge to manage expenses and take care of the court costs and grant money that fuels it. I pledge to safeguard and preserve the taxpayer's operating funds as an elected fiduciary and to use this money very conservatively solely for drug treatment court needs. And I will hold everyone accountable who has any connection with these funds. I have already taken steps to reduce overhead by cutting all funding to for-profit entities on the treatment team. I will lead our team to obtain the most positive impact on the people who are courageously taking charge over their addictions. The family is the smallest unit of government and is the foundation for every form of government ever implemented by man. If the family unit fails, so will the government. Our families are not as strong as they once were. We see this reflected in our Juvenile Court. Our Juvenile Court parents have a common problem which breaks down their families: drug use and addiction. The heroin epidemic has reached Lafayette County and is fast catching up with methamphetamine as a drug of choice. Drugs have hurt family relationships, reduced educational focus on their children, limited employment opportunities, and even replaced their hopes and dreams for the future. Drugs have replaced hard work for a brighter future with an unsustainable and harmful alternate reality. I was also assigned this year to some of our local cities' municipal courts. I look forward to helping our communities resolve their local disputes. These cases are important to people who want a safe, peaceful, law-abiding neighborhood. And I continue to oversee our Guardianships, Conservatorships, Trusts, and Probate Estates, including our Public Administrator's cases. I will continue to timely protect creditors' rights and Missouri's reimbursement claims for taxpayer aide rendered, so that beneficiaries and heirs may quickly receive their distributions. I like serving the people who come to court and serving our community that relies on our judicial system. I thank the citizens of our county who have entrusted these judicial responsibilities to me over the past three years. And I look forward to serving the people of our county and the court parties during the 2019-2023 term as well. Cherie Mason, Auditor, is running for re-election in November of 2018 and is unopposed. This is my 6thterm as your County Auditor. The Missouri Association of County Auditors provides yearly training which I have attended annually to keep current with any and all changes that affects the Auditor’s Office. I have had the privilege of previously serving for two years each as Secretary-Treasurer and President of the Missouri Auditor’s Association and have been in charge of acquiring speakers for the training. I have worked diligently for the citizens of Lafayette County through the years to improve and simplify the services and efficiency of the Auditor’s office. I have embraced the many changes Lafayette County has faced over the years and would like the opportunity to continue to keep the Auditor’s Office current with any issues that come along. I enjoy working with all the officeholders in understanding how their office receives revenues and make disbursements. I would appreciate your continued support as I will be seeking another term as your County Auditor. I will be mindful and continue working for the citizens of Lafayette County. The County Auditor is responsible for examining the tax receipts of the Collector daily, the monthly reports of all offices and departments who collect or handle money, and audit all offices bank accounts annually; prepare the County’s financial statement and liability report and present them to the County Commission; review the accounting of all revenues; verify all expenditures against budgets for weekly payments to vendors. The office also prepares a statement of estimated revenues of the County, classified to funds and source along with an itemized list of expenditures for previous and current years for all offices to use as they prepare their individual budget to present to the budget officer and the County Commission. The Auditor monitors and evaluates the condition of the County Budget for all funds. The office also performs an annual inventory of county fixed assets, countersign all liquor and merchant licenses. Alpha Epsilon Beta of Beta Sigma Phi Sorority. Served as President, Secretary and Treasurer. Federated Republican Women. Served as Treasurer for several years. JoAnn Swartz, Recorder of Deeds, is running for re-election in November of 2018 and is unopposed. This is my fourth year in my first term as the Recorder of Deeds. My prior experience includes working as a full time Deputy Recorder for fourteen years, 3+ years working in the Assessor's office and 4+ years banking experience. I attend 20 hours annual training with the Recorder's Association of Missouri every spring that keeps us up to date with Legislative discussions and any possible changes coming our way. It is also a way to gain additional knowledge from other Recorder's situations and experiences. The Recorder of Deeds is responsible for recording all documents pertaining to real estate, such as Warranty Deeds, Deeds of Trust, Quit Claim Deeds, Beneficiary Deeds, etc. The Recorder is also responsible for recording Marriage Licenses, Military Discharges, Plats, Surveys, Commissions and Bonds of elected officials, Notices of State and Federal Tax Liens and numerous miscellaneous documents. Public relations play a key in the duties of the day to day functions of the office. County taxpayers and visitors from all over the United States come in to do research and ask questions. Recording fees set by the state statute are collected and disbursed monthly to various county accounts and to the Missouri Department of Revenue. Monthly and yearly reports are provided to the County Commissioners, County Treasurer and County Auditor. Kim Mason, candidate for Circuit Clerk, is running unopposed in an open seat in the November election. Kim Mason has worked for the current Lafayette County Circuit Clerk, Deana Aversman, since 2005. Kim was born and raised in Independence, Mo., and graduated from Rockhurst University with a BSBA in Marketing. She is married to Mike Mason, and they make their home in Higginsville. The Masons have one son, Benjamin. Kim is a member of the Corder Lions Club. 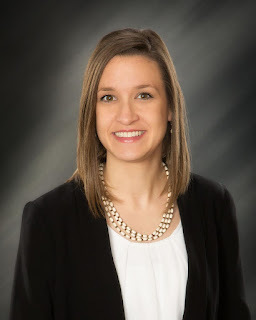 She and her family attend St. Mary’s Catholic Church in Higginsville where she is co-chair of the Stewardship Committee, Confirmation Director and helps teach the high school Parish School of Religion (PSR) program. From 2018 Odessa City Guide: Welcome to Lafayette County, Heart of Missouri's Old Trails Region. 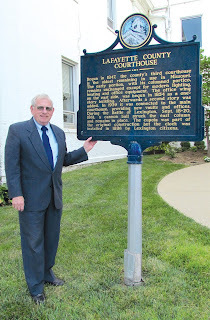 When you visit our county seat in Lexington, you will see a plaque describing our historic courthouse, built in 1847 and the oldest in continuous use east of the Mississippi River. It is known far and wide for the cannonball embedded in the upper left column, a remnant of the Civil War Battle of Lexington, fought September 18-20, 1861. Rich in history, the old Santa Fe Trail wanders through Lafayette County where Lewis and Clark once camped and where Native Americans, explorers, traders and Civil War armies journeyed through this region. Today, Lafayette County is an area rich with agricultural farming operations as well as orchards, produce farms and vineyards. Tourists looking for a day trip or weekend getaway destination will find wineries, produce vendors, farmers’ markets, unique shops, restaurants and bed-and breakfasts. In addition to tourism, Lafayette County is a perfect destination for those interested in starting a small business or in entrepreneurial investment opportunities. We welcome inquiries and will be happy to help provide the economic and demographic information needed. Lafayette County is blessed to have excellent public, private and technical schools, exceptional emergency services, airports serving small aircraft, city parks and aquatic centers, numerous sports and recreational facilities, five community newspapers and a variety of churches to meet the spiritual needs of our residents. In Lafayette County, we have a strong volunteer spirit that can’t be matched as local residents work continuously for the betterment of their communities and county to improve the quality of life for all our citizens. Whether you have lived here a long time or are just visiting, we are glad you are here and thank you for being a part of this area that is rich in history and heritage, agricultural bounty and economic promise.